Along with some of the confusion around what exercise you should or shouldn’t do during pregnancy comes a long list of myths that have evolved. If you were a runner before pregnancy and you are having an uncomplicated pregnancy, then you will be able to continue running, at least to some extent but how long, how intense and how far into your pregnancy will vary from woman to woman. It may even vary from one of your own pregnancies to the next. You might not be able to keep up the same pace and intensity as you did before, and it will get more difficult to run as your belly gets larger; however, it’s always best to discuss this with your doctor. exercises that require that you lie on your back after the first trimester. While you may have some additional nutritional needs if you are quite active, according to the Australian Dietary Guidelines you will probably need only up to about 2 ½ additional serves of food per day. We now know that regular, low to moderate exercise during a healthy pregnancy is safe. This can include a combination of cardio and resistance training. 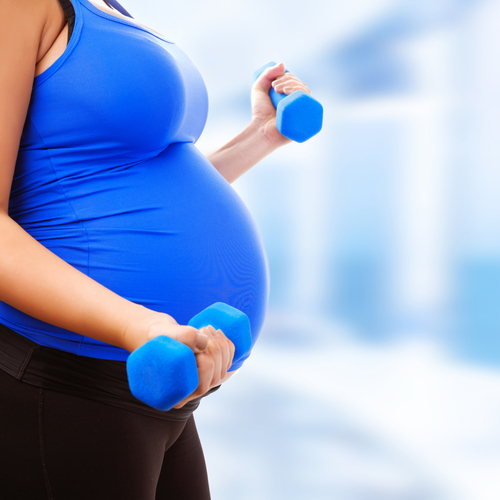 Remember not to hold your breath during exercises and avoid lifting heavier weights than you were prior to pregnancy. You will need to speak to your doctor but your situation during your pregnancy can change throughout. Just because there was an indication to stop exercise at one point doesn’t mean you need to avoid exercise altogether for the rest of the pregnancy. Unfortunately some women will experience a minor, or sometimes major, split of the abdominal muscles down the middle of the tummy. This becomes more apparent after delivery. Take care with your abdominal exercises and, again, avoid abdominal exercises that are not appropriate during pregnancy. Pregnancy-specific pilates or yoga classes may assist with maintaining a strong core during pregnancy. First up, morning sickness is itself a myth! It doesn’t just happen in the morning for some women, and it doesn’t always last only for the first few months of pregnancy. If you are suffering from any form of nausea or vomiting during pregnancy, then there is no way of knowing how long it will last. If you are able to keep your food down and your fluid levels up, then your doctor will likely let you continue exercising as normal. This means that you can try to fit in exercise, if you feel you feel up to it. If the energy is just not there then you may have some days where you just can’t manage it. Always aim to schedule exercise at times in the day when you feel well . Other reasons may include diabetes, anaemia, asthma or lung or joint problems. Speak to your doctor if you are unsure. ← To Stay Home or Return to Work?